I had a bad problem with froghoppers last summer and I noticed they’re coming back this year. What can I use to get rid of them for good? Last year I sprayed with some milky spore but that didn’t seem to affect them. I’m not surprised the milky spore didn’t help. If you review the label, you’ll learn its for japanese beetles and not froghoppers. The good news is we know this pest well and more importantly, they’re easy to control. 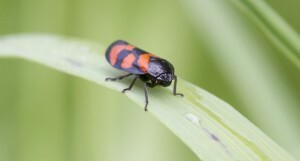 More commonly called spittlebugs, this pest can definitely cause damage to any lawn they infest. But they’re easy to kill and it usually takes just 2 treatments to knock them out. For small yards of 5,000 sq/ft or less, spray CYONARA RTS over the entire yard. Retreat in 3-4 weeks and that should do the job. Cyonara is odorless and comes in a hose end type sprayer. One quart will cover just over 15,000 sq/ft so one jug will be enough to treat a small yard a few times. If you have a large yard, say 10,000 or more sq/ft, get BIFEN XTS. 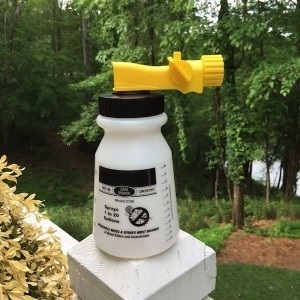 Its super concentrated and you only need 2 oz in 10 gallons of water to treat 10,000 sq/ft. Like the Cyonara, its fast working and if you treat in 3-4 weeks after the initial application, you should knock them out for good. Lastly, you will need a good HOSE END SPRAYER to apply the Bifen.